While you will never be a Master of Puppets like Metallica, the new for Fall 2017 Dainese Rain Master D-Dry Jacket will make you a master of sky tears. 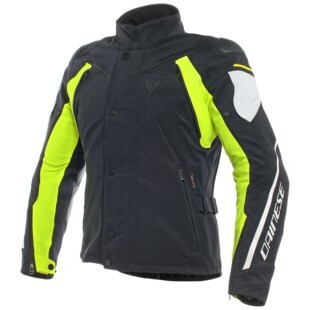 Designed for touring and sport-touring, the Rain Master is made from stretchy Mugello fabric for comfort and cow hide in the impact areas for increased protection. It will make you a master of micturating clouds through its removable D-Dry waterproof liner. Cold weather? Pop in the included insulating liner. Hot weather? Take out both liners, stow on your bike or in one of the jacket's many pockets, and open up the chest and back air vents for flow-through air. The Rain Master includes removable CE level 1 approved armor at the shoulder and elbows and is made to accept Dainese's Double Chest Protector and G1/G2 back protectors. Protection at a masterful level.